Ride and Read! NEWS by Madness Photography - Onno "Berserk" Wieringa: The fattest FatBook™ ever is out now! With 1924 pages this edition is a real FAT book literally. The 2019 FatBook™ bike is a perfect example of the variety of products, the wholesaler Parts Europe is offering for newer Harley-Davidson® models. It started out as a bone-stock 2018 Fat Bob® Softail. Then the creative talents of Drag Specialties and Trask Performance were activated and teamed up to create a truly unique machine with muscle-bike presence and style. The project continues the collaboration process between top vendors/builders in the industry and Drag Specialties. The goal is always to change things up, to innovate and create something that stands out and showcases the quality of both the customizers and the parts selected for use on the bike. The M-Eight Fat Bob® Softail® features multiple products from the FatBook™ including Trask Performance, Legends Suspension, Arlen Ness, Joker Machine, Ken’s Factory, Custom Dynamics and a custom-stitched Drag Specialties seat. Of course you will find much more products and brands for customizing and maintenance in the new edition of the famous FatBook™ of Parts Europe / Drag Specialties. Like all catalogs the FatBook™ can be browsed through online or downloaded as PDF-file. 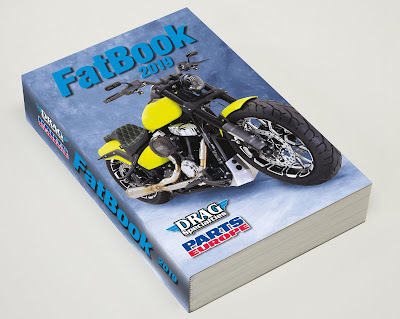 Visit www.dragspecialties.eu or www.partseurope.eu, check the catalogs and click on the FatBook™ cover. All products are available at Parts Europe / Drag Specialties dealers. You will easily find the nearest dealer online with the dealer search at https://partseurope.eu/cms/en/dealer-search.